Bitcoin continued in the uptrend above $7,380 resistance and brushed shoulders with $7,400. Is Mt. Gox intending to dump BTC gain or is it Silk Road; the darknet website shut down in 2013? Bitcoin embraced the support discussed in yesterday’s analysis at $7,340. In fact, the price pulled further up past the resistance at $7,380. Bitcoin changed hands briefly above $7,400 (month’s high) but declined sharply only to find support marginally below $7,340. 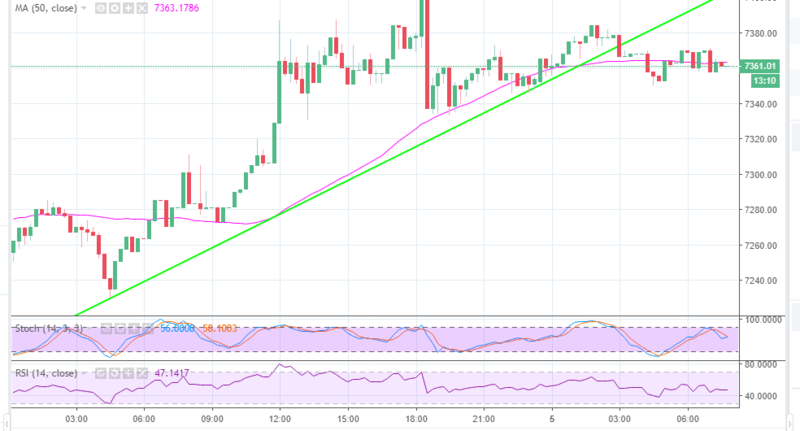 The intraday upside is capped at $7,380 but BTC/USD is seeking balance above $7,360. The crypto space is curiously concerned about the rumors that a Bitcoin whale is intending to dump a colossal amount of BTC on the market. At least $1 billion in BTC could be headed for the market that has been highly volatile and delicate since the year began. Bitcoin is taking up more than half of the market’s total capitalization. Such a huge sum of BTC would be devastating not only for Bitcoin price but also other digital assets. A couple of theories seeking to identify the whale have surfaced on the internet. The initial one links Silk Road, a popular darknet website that was shut down by the FBI after two years of operation in 2013 and second one is the infamous Mt. Gox. The website is said to have enabled illegal transactions via Bitcoin (BTC) around the time of its inception in 2011. Bitcoin was also gaining popularity at this time but was trading between $1 and $31. The original Silk Road wallet that had at least 111,114.62 BTC is likely to have increased in value to approximately $844 million. In the meantime, Bitcoin is trading below the trendline support at $7,373.02 but the buyers are battling for recoil above $7,370. The stubborn resistance at $7,380 must be cleared for a clear path towards $7,400 to come to light. Bitcoin buyers must find a support above $7,400 in order for them to avoid the frequent dips towards the short-term support ($7,340). The stochastic and the RSI are ranging signaling that the trend will be upwards sideways in the short-term. A couple of critical supports exist above $7,000 at $7,300 and $7,200.